A new study by David Spence and colleagues, published online in July 2012 in the journal Atherosclerosis (), has been gaining increasing media attention (e.g., ). The article is titled: “Egg yolk consumption and carotid plaque”. As the title implies, the study focuses on egg yolk consumption and its association with carotid artery plaque buildup. The study argues that “regular consumption of egg yolk should be avoided by persons at risk of cardiovascular disease”. It hints at egg yolks being unhealthy in general, possibly even more so than cigarettes. Solid critiques have already been posted on blogs by Mark Sisson, Chris Masterjohn, and Zoe Harcombe (, , ), among others. These critiques present valid arguments for why the key findings of the study cannot be accepted, especially the finding that eggs are more dangerous to one’s health than cigarettes. This post is a bit different. It uses the data reported in the study to show that it (the data) suggests that egg consumption is actually health-promoting. I used the numbers in Table 2 of the article to conduct a test that is rarely if ever conducted in health studies – a moderating effect test. I left out the “egg-yolk years” variable used by the authors, and focused on weekly egg consumption (see Chris’s critique). My analysis, using WarpPLS (), had to be done only visually, because using values from Table 2 meant that I had access only to data on a few variables organized in quintiles. That is, my analysis here using aggregate data is an N=5 analysis; a small sample indeed. The full-text article is not available publicly; Zoe was kind enough to include the data from Table 2 in her critique post. Below is the model that I used for the moderating effect test. It allowed me to look into the effect that the variable EggsWk (number of eggs consumed per week) had on the association between LDL (LDL cholesterol) and Plaque (carotid plaque). This type of effect, namely a moderating effect, is confusing to many people, because it is essentially the effect that a variable has on the effect of another variable on a third. Still, being confusing does not mean being less important. I should note that this type of effect is similar to a type of conditional association tested via Bayesian statistics – if one eats more eggs, what is the association between having a high LDL cholesterol and plaque buildup? You can see what is happening visually on the graph below. The plot on the left side is for low weekly egg consumption. In it, the association between LDL cholesterol and plaque is positive – eating fewer eggs, plaque and LDL increase together. The plot on the right side is for high weekly egg consumption. In this second plot, the association between LDL cholesterol and plaque is negative – eating more eggs, plaque decreases as LDL increases. And what is the turning point? It is about 2.3 eggs per week. So the “evil” particle, the LDL, is playing tricks with us; but thankfully the wonderful eggs come to the rescue, right? Well, it looks a bit like it, but maybe other foods would have a similar effect. 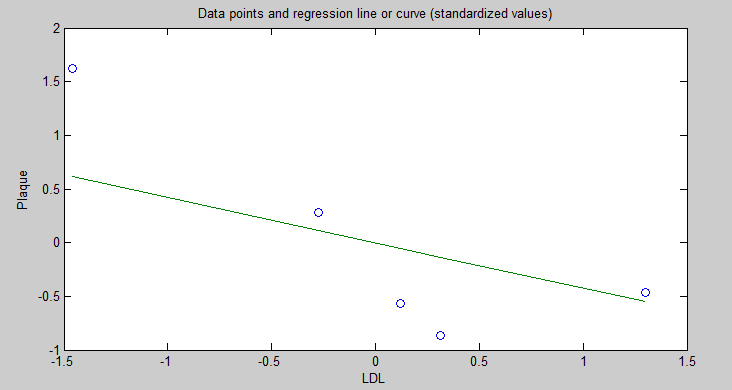 In part because of the moderating effect discussed above, the multivariate association between LDL cholesterol and plaque was overall negative. This multivariate association was estimated controlling for the moderating effect of weekly egg consumption. You can see this on the plot below. The highest amount of plaque is at the far left of the plot. It is associated with the lowest LDL cholesterol quintile. (So much for eggs causing plaque via LDL cholesterol eh!?) What is happening here? Maybe egg consumption above a certain level shifts the size of the LDL particles from small to large, making the potentially atherogenic ones harmless. 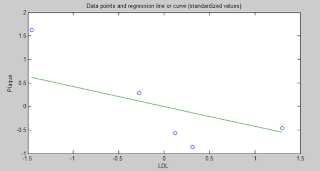 (Saturated fat consumption, in the context of a nutritious diet in lean individuals, seems to have a similar effect.) Maybe eggs contain nutrients that promote overall health, leading LDL particles to "behave" and do what they are supposed to do. Maybe it is a combination of these and other effects. The Ancestral Health Symposium 2012 was very interesting on many levels. Aaron Blaisdell and the team of volunteers really did a superb job at organizing the Symposium. Boston is a great city with an excellent public transportation system, something that is always great for meetings, and a great choice for the Symposium. Needless to say, so was Harvard. Even though the program was packed there were plenty of opportunities to meet and talk with several people during the breaks. We had our panel “New Technologies and New Opportunities”, which Paul Jaminet moderated. The panelists were Chris Keller, Chris Kresser, Dan Pardi, and myself. The first photo below, by Bobby Gill, shows Chris Keller speaking; I am on the far left looking at the screen. The second photo, by Beth Mazur, shows all the panelists. The third photo, also by Bobby Gill, shows a group of us talking to Stephan Guyenet after his presentation. 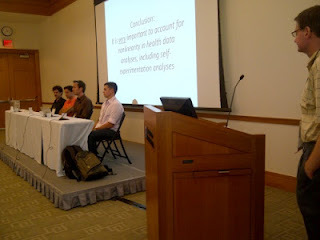 I talked a bit toward the end of the panel about the importance of taking nonlinearity into consideration in analyses of health data, but ended up being remembered later for saying that “men are women with a few design flaws”. I said that to highlight the strong protective effect of being female in terms of health, which was clear from the model I was discussing. There is a good evolutionary reason for the protective effect of being female. Evolution is a population phenomenon. Genes do not evolve; neither do individuals. Populations evolve through the spread or disappearance of genotypes. A healthy population with 99 men and 1 woman will probably disappear quickly, and so will its gene pool. A healthy population with 99 women and 1 man will probably thrive, even with the drag of inbreeding depression. Under harsh environmental conditions, the rate of female-to-male births goes up, in some cases quite a lot. I was able to talk to, or at least meet briefly face-to-face with, many of the people that I have interacted with online on this blog and other blogs. Just to name a few: Miki Ben-Dor, Aaron Blaisdell, Emily Deans, Andreas Eenfeldt, Glenn Ellmers, Benjamin Gebhard, Stephan Guyenet, Dallas Hartwig, Melissa Hartwig, Paul Jaminet, Chris Keller, Chris Kresser, Mathieu Lalonde, Robert Lustig, Chris Masterjohn, Beth Mazur, Denise Minger, Jimmy Moore, Katherine Morrison, Richard Nikoley, Dan Pardi, Kamal Patel, David Pendergrass, Mark Sisson, Mary Beth Smrtic, J. Stanton, Carlos Andres Toro, and Grayson Wheatley. It would have been nice to have Peter (from Hyperlipid) there, as I think a lot of the attendants are fans. I attended Jamie Scott’s very interesting talk, but ended up not being able to chat with him. This is a pity because we share some common experiences – e.g., I lived in New Zealand for a few years. I did have the opportunity to talk at some length with J. Stanton, who is an inspiration. It was also great to exchange some ideas with my panelists, Miki Ben-Dor, Emily Deans, Stephan Guyenet, Chris Masterjohn, Kamal Patel, and David Pendergrass. I wish I had more time to talk with Denise Minger, who is clearly a very nice person in addition to being very smart. Talking about a smart person, it was also nice chatting a bit with Richard Nikoley; a successful entrepreneur who is in the enviable position of doing what he feels like doing. I could not help but notice a tendency among some participants (perhaps many, judging from online threads) to pay a lot of attention to how other people looked in a very judgmental way. That person is too fat, his/her face is too red, she/he looks too old etc. So was this supposed to be the Ancestral Health Pageant 2012? There is nothing wrong with looking good. But many people adopt an evolution-inspired lifestyle because they are quite unhealthy to start with. And this includes some of the presenters. It takes time to change one’s health, relapses occur, and no one is getting younger. Moreover, some of the presenters’ ideas and advice may have much more dramatic positive effects on people other than themselves, because of their own pre-existing conditions. The ideas and advice are still solid. 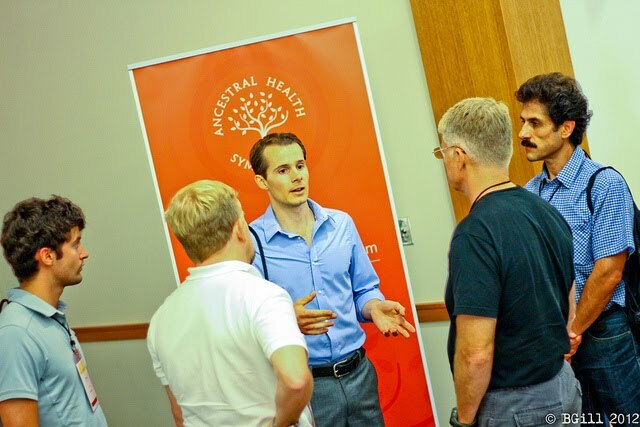 A message that I think this Symposium conveyed particularly well was that an evolutionarily sound diet and lifestyle can truly revolutionize our health care system. Robb Wolf’s talk in particular, based on his recent experience in Nevada with law enforcement officers, made this point very effectively. The title of the talk is “How Markets and Evolution Can Revolutionize Medicine”. One very interesting idea he put forth was that establishments like gyms could expand the range of support activities they offer their customers, officially becoming the beginning of the health care chain. There are already health insurance plans that offer premium reductions for those who go to gyms. Being part of the health care chain would be different and a significant step forward - diet and exercise are powerful "drugs". One thing that caught me a bit off-guard was Robb’s strong advocacy of the use of a drug, namely metformin (a.k.a. glucophage); even preventively in some special cases, such as with sleep-deprived law enforcement officers. I have to listen to that talk again when it is up online, to make sure that I understood it correctly. It seems to me that changing the nature of shift work among law enforcement officers, at least partially, may be a better target; current practices appear not only to impair the officers’ health but also their effectiveness in law enforcement activities. Besides, I think we need to better understand the nature and functions of cortisol, which is viewed by many as a hormone that exists only to do us harm. Sleep deprivation is associated with an elevation in cortisol production. Elevated cortisol levels lead over time to visceral fat accumulation, which promotes systemic inflammation. Systemic inflammation is possibly the root cause of most diseases of civilization. But cortisol itself has powerful anti-inflammatory properties, and visceral fat is generally easy to mobilize through intense exercise – probably one of the key reasons why we have visceral fat. I think we need to understand this situation a bit better before thinking about preventive uses of metformin, which nevertheless is a drug that seems to do wonders in the treatment of type 2 diabetes. 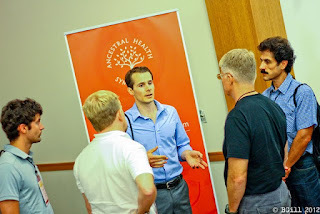 Beth Mazur was kind enough to put up a post with links to various Ancestral Health Symposium 2012 summary posts, as well as pictures. 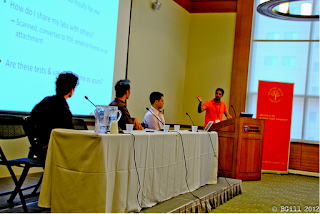 Paul Jaminet has a post with an insightful discussion of our panel at the Symposium.